Erin Royer is a classically trained saxophonist, specialising on the tenor saxophone. In 2010 Erin received a Bachelor of Music (Classical Performance) at the Western Australian Academy of Performing Arts (WAAPA), under the guidance of Dr. Matthew Styles. In 2011 Erin completed an honours research degree with first class honours, which focused on career pathways for the twenty-first century classical tenor saxophonist. During Erin’s studies she received many awards and scholarships. Most notable of these were receiving honouree recognition by the Dean of Education and Arts, Edith Cowan University 2009, winning the Barbara MacLeod Scholarship awarded to the top performing student at WAAPA 2011, achieving the top woodwind performer in the same year and becoming a member of the Golden Key International Society, exclusively for high achieving students. With the funding received from the Barbara Macleod scholarship Erin travelled to England for a 3 month international journey, which was self organised to improve her saxophone abilities, to make musical contacts and to experience live music from different parts of the world. This journey began at the internationally established, World Saxophone Congress held in St Andrews, where she was selected to perform as the youngest Australian delegate a 30 minute recital of self commissioned works for tenor saxophone and piano, to showcase local Western Australian compositions. During the congress Erin made many valuable contacts and friendships, which have begun to help Erin in establishing herself as an international saxophonist. After the congress Erin organized private saxophone lessons with two of the worlds highly sought after saxophonists, Andy Scott and Rob Buckland. With these lessons Erin focused on refining her technique on the saxophone and gaining an insight to what lengths both Scott and Buckland have had to take to become internationally renowned saxophonists. Currently Erin is the head of saxophone at the University of Western Australia, and tutors at The Western Australian Academy of Performing Arts. Erin is also the saxophone tutor for Wesley College, lumen Christi College and Mercedes College. Erin is a casual member of the Malaysian Philharmonic Orchestra, having performed Gershwin’s An American in Paris during October 2012, and Romeo and Juliet in August 2013. Erin is a regular performer around Perth, Western Australia, performing with The Oz Big Band, The Western Australian Youth Jazz Orchestra, and the exciting saxophone quartet, Just Sax. In addition to Erin’s performance career she also runs a saxophone repair business called Just Sax Repairs, having gained the necessary skills in saxophone repair under the guidance of repair specialist Steve Crow, whilst over in England 2012. Erin aspires to become an internationally renowned performer, promoter and tutor of the saxophone and is determined, as a life goal, to make Perth, Western Australia a sought after place to study saxophone. First performing together in 2008, Duke and Howie have made the impetus for their duo the presentation of exciting and innovative chamber music. Of particular interest and drive for the duo has been their close collaboration with some of Australia’s most prominent and respected composers commissioning, recording and performing these new works written specifically for them. Leading composers that have written for HD Duo include: Anne Boyd, Michael Smetanin, Matthew Hindson, Mark Zadro, Andrew Batterham, Brenton Broadstock, Miriama Young, Catherine Likhuta and Paul Sarcich. Meeting as colleagues at the Sydney Conservatorium of Music, the Duo is frequently featured on the conservatorium’s concert series. As well as performing regularly across the major cities of Australia, HD Duo has also appeared in concert throughout the world in countries such as Thailand, USA, England, Scotland, Mexico, France and French Polynesia New Caledonia. Some highlights have included: performances at multiple World Saxophone Congress’ (2009, 2012, 2015), being featured artists at the North American Saxophone Alliance conference Indianola, Iowa (2011), their UK debut in concert at “Australia House" in London (2012), the Australasian Saxophone and Clarinet Conference (2013) and recital concerts at the Festival de Mexico in Mexico City (2014). As seasoned educators HD Duo has relished the opportunity to work with students presenting master classes and workshops at institutions that include: the University of Minnesota, California State University Long Beach, Indiana University Bloomington, University of Wisconsin at Oshkosh, Edith Cowen University, Charles Darwin Univeristy and the University of Queensland. In 2014 their second recording “Incandescence: Music for saxophone and piano by female composers" was released on the Saxophone Classics Label (UK). 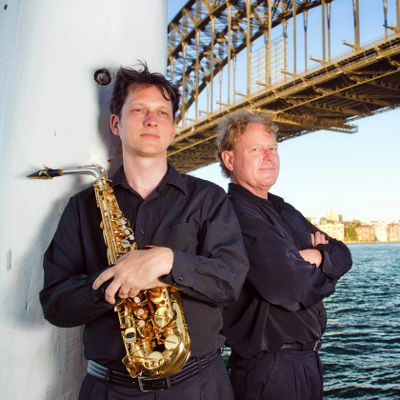 In 2015 they were recipients of a COALAR (Council on Australia Latin America Relations) grant that enabled them to commission new works by Mexican and Australian composers for their third CD. They travelled to Mexico City, where they workshopped the new Mexican pieces with the composers, performing the works along with the new Australian compositions in concerts and a live broadcast at Opus FM. They also gave masterclasses at NICO and the Universidad Nacional Autonoma de Mexico. Over the rest of 2015 they will be touring the new works throughout the major cities in Australia.